The Free State of Prussia was established in 1918 following the German Revolution, abolishing the German Empire and founding the Weimar Republic in the aftermath of the First World War. The new state was a direct successor to the Kingdom of Prussia, but featured a democratic, republican government and smaller area based on territorial changes after the war. Prussia remained the dominant state of Germany, comprising almost ​5⁄8 (62.5%) of the country's territory and population, and home to the federal capital, Berlin. 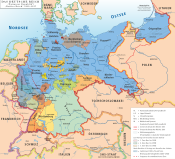 Prussia changed from the authoritarian state it had been under previous rulers to a democratic bastion within the Weimar Republic where, unlike in other states, democratic parties always ruled in majority. Except for its overseas colonies, Alsace-Lorraine and the Bavarian portion of the Saargebiet, all German territorial losses as a result of World War I were Prussian losses. As specified in the Treaty of Versailles, the former kingdom lost territory to Belgium (Eupen and Malmedy), Denmark (North Schleswig), Lithuania (Memel Territory) and Czechoslovakia (the Hultschin area). The Saargebiet was administered by the League of Nations until 1935. The Rhine Province became a demilitarised zone. Two years later, Hitler (who by then was head of state and the absolute dictator of Germany) formally transferred the office of Prussian Reichsstatthalter from himself to Göring. This office, as well as that of Minister-President (which Göring had already held from 1933) continued to exist but were subservient to the Nazi regime. Some changes were still made to Prussian provinces after this time. 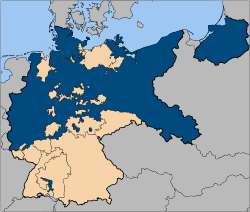 For example, the Greater Hamburg Act of 1937 transferred some territory from the provinces of Hanover and Schleswig-Holstein to Hamburg while at the same time annexing Hamburgian Geesthacht and the Hanseatic City of Lübeck to Schleswig-Holstein as well as Hamburgian Cuxhaven to the Province of Hanover. Other redeployments took place in 1939, involving cessions of Prusso-Hanoveran suburban municipalities to Bremen and in return the annexation of Bremian Bremerhaven to the Province of Hanover. Also Hanoveran Wilhelmshaven was ceded to Oldenburg. In 1942 redeployments involved the provinces of Saxony and Hanover and the Brunswick. What remained of Prussia comprised both a little over half of the remaining German territory and a little over half of Prussia's pre-1914 territory. In Law No. 46 of 25 February 1947, the Allied Control Council proclaimed the dissolution of the Prussian state. The Allies cited Prussia's history of militarism as a reason for dissolving it. Prussia had ceased to exercise administrative functions in 1933 and these had now been absorbed into the administration of the occupying powers in their respective geographic areas of control.